BriteView Technologies offers state of the art, high efficiency backlighting systems and components for a wide range of applications. Using a color filter, this single light pipe backlighting system has two operational modes for day or night vision operation. The Dual Mode Backlighting System can illuminate a given display with lights of different spectrums and intensities. Output lights for both modes have the same angle. With the appropriate color filter placed between the CCFLs or LEDs and the light pipe, the Dual Model Backlighting System produces a spectrum of output light that is compatible with night vision goggles in the night vision mode. The Stacked Flat Collimator Backlights, which are stackable and transparent, were designed to achieve very high output brightness. The Stacked Flat Collimator is suitable for large size LCDs requiring very high brightness, excellent dimming and high efficiency. 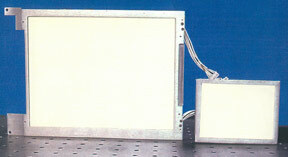 Most traditional backlights position the CCFLs within the viewing area, so that the viewer looks directly at the CCFLs. The AMLCD is heated by the CCFLs positioned adjacent to it. Transferring heat to the backlight chassis and out of the unit is difficult. The Advanced Micro-Prism Edge-Lit backlight, developed by BriteView Technologies, positions the CCFLs along the edge of the light guide outside of the viewing area, so that the viewer does not look directly at the CCFLs. The change in lamp placement enables heat transfer to the backlight and system chassis. The heat effect on AMLCD is negligible. With a novel beam expander technology, this backlighting system can illuminate a lighting area essentially from edge to edge. This viewing area expanding technology is especially valuable for displays requiring a very limited boarder area. With the Divergent Angle Rotator technology, this backlighting system is designed using LEDs as the light source. The Divergent Angle Rotator backlight architecture can reduce or eliminate the head beams non-uniformity problem associated with a point-like light source without sacrificing brightness. The LED backlight includes white LED and RGB LED. The LED PC Board is made from an insulated metal substrate for heat management. The RGB LED Backlight uses a color management system feedback controller to provide light of the specified color coordinate or color temperature. BriteView designs metal chassis to dissipate heat generated by the LEDs, so that no fan is needed for the backlight. This backlighting system utilizes the Divergent Angle Rotator technology to achieve a wide viewing angle of ±45°C in the horizontal direction. This feature is especially suitable for especially large display applications in which more than one person views the display. A viewing angle expanding film can be used to increase the viewing angle to over ±60°C. Backlight system without a border area, so that the total area of the backlight was the size of the display itself.